VANCOUVER — Members of the Vancouver City Council voted 4-2 in favor of appointing Laurie Lebowsky to council Position 1, filling a vacancy left after November’s general election. The Position 1 seat was vacated last year when Council Member Jack Burkman did not seek reelection. Scott Campbell was the winner of the election, but he passed away in September before the election. City policy is to allow the city council to appoint a candidate to fill the vacant position until the next general election. Applications for the vacant seat opened on Dec. 26, 2017, and closed on Jan. 18. In total, 56 applications were received. 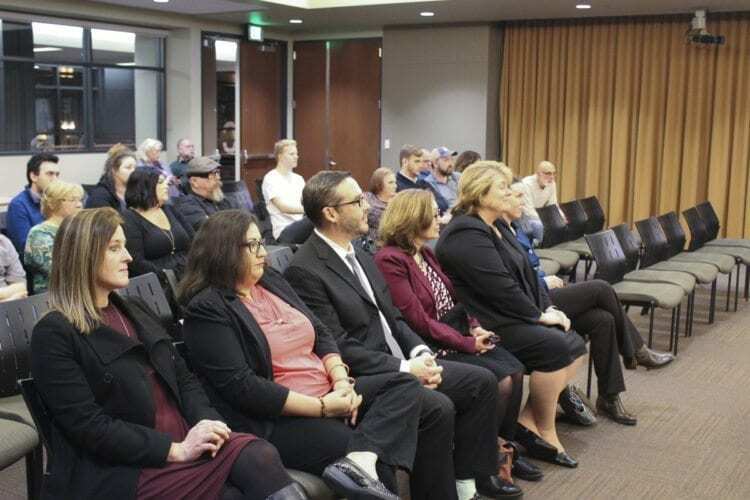 Members of the council met on the morning of Feb. 6 to hold an executive session in which they selected a pool of candidates to interview for the position. The six candidates selected were Dina “Elizabeth” Hovde, Laurie Lebowsky, Sarah Fox, Carmen McKibben, Mary Elkin and Erik Paulsen. At a special city council meeting on Monday evening, each of the candidates were interviewed by the city council. Once the six interviews were finished, the council entered an executive session to discuss the qualifications of the selected candidates. Council then reconvened in a public session to nominate and vote on the candidates. During the interview process, all candidates were sequestered until all interviews were complete. Each candidate had an opportunity to provide background information on themselves, and then answer one question from each council member. Afterwards, council members were free to ask any follow up questions they saw fit. Hovde has lived in the Vancouver area since 1998, and since then has worked as a newspaper columnist. She has worked for The Oregonian in that capacity for about 10 years, and had worked at The Columbian prior to that. Lebowsky grew up in Indiana, and attended Michigan State University and in 1992 moved to the Portland area to attend Portland State University to study urban planning. She has worked in planning for approximately 24 years, first for ODOT, then for Washington County and currently works for Clark County conducting transportation planning. She has lived in Vancouver since 2016. Fox grew up in Vancouver. For the last 13 years, she has worked as a city planner for the city of Camas. After graduating high school, Fox served four years in the Army, and then attended college, gaining a masters in urban and regional planning. For the past six years, she has served as the union president of the Camas Public Employee’s Association. She has also served as the president of a regional component of the American Planning Association since 2017. McKibben moved to Vancouver in 2013, after living in Phoenix. She currently serves as the council president for the Southwest Washington League of United Latin American Citizens, as well as the deputy director for the group’s Washington state chapter. She has a background in business and finance, and earned an MBA from Grand Canyon University. In Phoenix, McKibben worked for about eight years for a Fortune 500 company. She currently operates a mobile food cart. Elkin has lived in Vancouver since 2002. In 2003, she opened a small business focusing on accounting and bookkeeping. In 2010, she became involved in community action when the city council proposed closing a neighborhood fire station. She became involved as a Fire Corps volunteer and is currently chair of both the Image Neighborhood Association and the Vancouver Neighborhood Alliance. Paulsen has lived in the Vancouver area for approximately 40 years. He graduated from Portland State University with a bachelor’s in economics and received a master of business administration from Washington State University Vancouver. For the past 25 years, Paulsen has worked for U.S. Bancorp in wealth management. He has also served for seven years on Vancouver’s planning commission, with four years serving as its chair. Lebowsky was then asked to state what she would do to improve the neighborhood in which she lived. As a resident of the Lincoln neighborhood, Lebowsky said that there are a lot of children and families, and that she wants to make sure the roads are safe for them. She also said that there is a problem with through traffic and speeding, and she would want to make sure steps were taken to reduce that issue. When asked to describe how she is perceived by others and how she perceives herself, Lebowsky said that she is “pretty open” and “very communicative.” She also explained that she has a lot of initiative and characterizes herself as brave. Lebowsky said that the issue of needing a new I-5 bridge was one of the most important challenges facing the city council. From her past experience, she said that “I know about change, making change happen and how government works.” According to Lebowsky, that experience would help her address the issue of the bridge. She said that the city alone cannot address the issue of the bridge, but that it can create partnerships to bring about changes. Lebowsky said that while she has never run an election campaign before, she does “have some connections in the city” and understands some of the key concepts of a campaign from her work on others’ campaigns. Her biggest challenge would be understanding campaign finance law. After the predetermined questions ended, council members asked follow up questions. Council Member Ty Stober asked how Vancouver could work effectively with the county to help make future annexations in the cities urban growth area successful. Lebowsky replied that the two entities could work to coordinate efforts in “terms of development or development regulations.” They could also coordinate with the county on comprehensive plan updates, Lebowsky said. She also said that in any attempt to address the bridge, “there has to be a component for mass transit.” Lebowsky said that whatever that component is, it needs to have its own right of way, such as a bus rapid transit system or light rail. Mayor Anne McEnerny-Ogle asked if Lebowsky’s employment with Clark County would create any conflicts of interest if selected to the council. Lebowsky said that there could potentially be conflicts in long range planning and parks. After each of the candidate interviews, the council went into executive session and then reconvened to vote. Only three candidates received motions to be appointed. These were Elkin, Paulen and Lebowsky. Both Elkin and Paulen only received two yes votes. Lebowsky received four yes votes. Bart Hansen and McEnerny-Ogle voted against her appointment. Hansen said that he had two other candidates that he would have chosen over Lebowsky. McEnerny-Ogle said that while Lebowsky is well versed in planning, she has lived in Vancouver less than two years. She also explained that there will be some conflicts of interest with Lebowsky’s county job, and that she had wanted a candidate that was “stronger” in volunteer work. “I feel honored that the council chose me,” Lebowsky said. 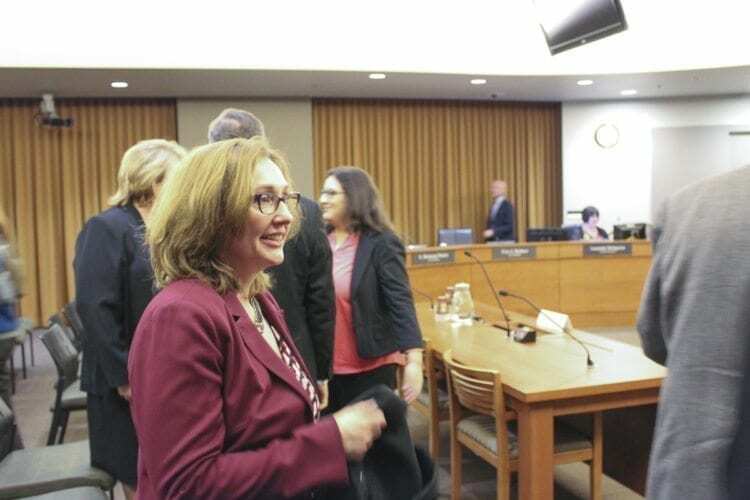 Lebowsky will be sworn in to her new position next Mon., Feb. 12.